Weather Radar June 2, 4:46 a.m. In the end it didn’t rain. The forecast had been rain for a couple of days. 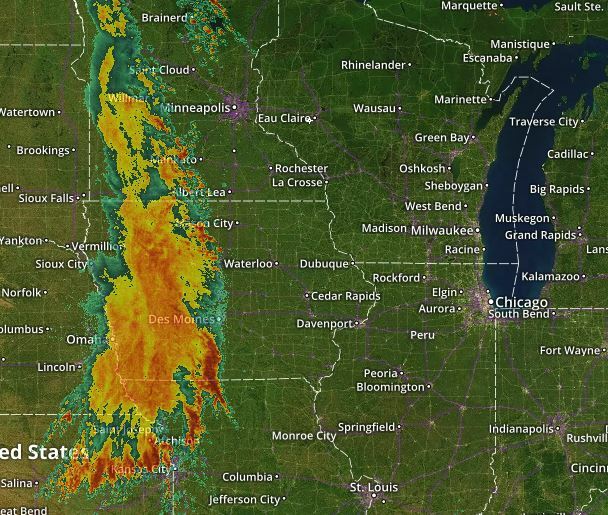 The weather radar looked ominous Saturday at 4 a.m. It was heading our way. At sunrise I went to the garden to beat the rain. Our garden is big enough to engage a person for hours — weeding, harvesting, planting, mulching, fence mending and the like. It never ends. I think there, mostly about our relationship with the environment and toward a food ecology, the dreams of gardeners. The work was to mulch tomatoes, weed carrots and beets, clean up kale leaves bitten by intense heat, replant seedlings where they failed and organize for the next planting session. The mulch collected this week is about half used. Before I plant, it must all be relocated to a final destination to clear space for peppers and beans. There is another day’s work waiting today. The garlic crop has been exciting. 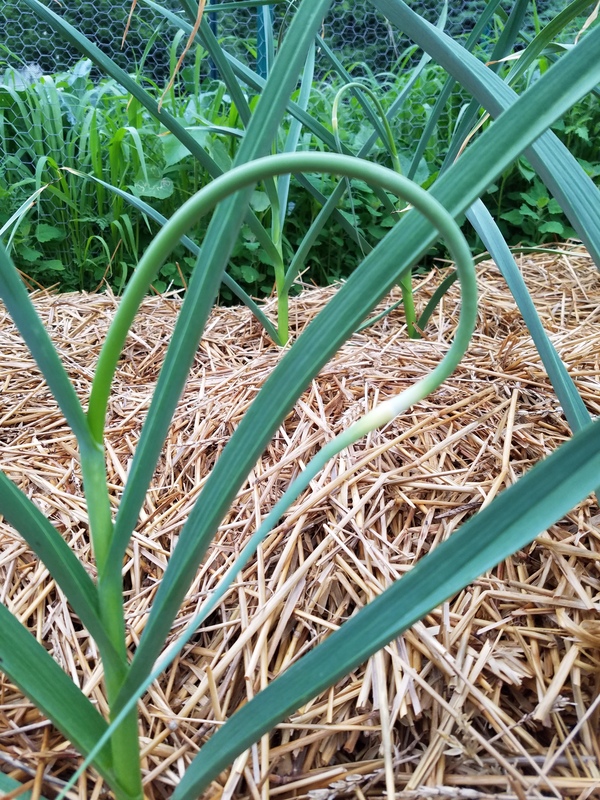 Scapes began to appear and as soon as they twist back around on themselves I’ll cut them off, to enable the bulbs to benefit from the plant’s energy, and to use them in the kitchen. The seeds were planted seven months ago so it’s great to see we’re getting closer to harvest. The cloud formation I saw on radar broke up before it got to us. Where I expected rain, there were blue skies. I got out the hose and watered. Like it or not, I must deal with my physical capabilities. I’ve been blessed with good health most of my life. When I had to give up running a couple years ago things began going downhill. What I mean is there was a perceptible decrease in flexibility and energy coupled with selected aches and pains in my shoulders, feet and hands. The foot pain is likely related to running although I’ve been spared the joint pain runners experience in their knees and hips. My shoulders? One of the transient doctors at the nearby clinic diagnosed arthritis, but I doubt it. I’ve learned to be careful not to injure myself with lifting. My back is sound. I get along. The main thing is dealing with energy levels. Instead of staying in the same place to finish a job I’ll take a break and go walking… to the garage, to my desk, to the kitchen. Sometimes I sit in the recliner for a while. I get back up and return to the garden. It’s a hodge-podgey way of doing things, however, I believe variation in work routine staves off further bodily ailments. It’s likely good for my mind as well. The spring share at the CSA finished on Monday. The ice box is filled with fresh greens and rhubarb. On deck is rhubarb something, a vegetable broth for canning, and spinach daily until the kale avalanche arrives. 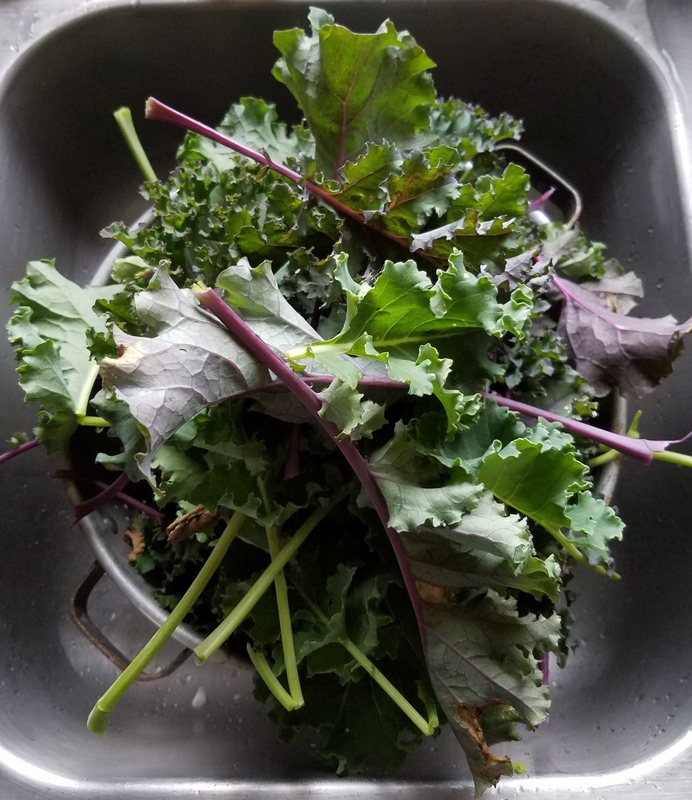 I did not barter for a summer share at either CSA in order to survive mostly from our garden. Each year I become a better grower. It enables us to sustain ourselves with fresh produce while the season continues. What more could we want in a turbulent world? This entry was posted in Environment, Garden and tagged Garden, local food, spring, sustainability. Bookmark the permalink.